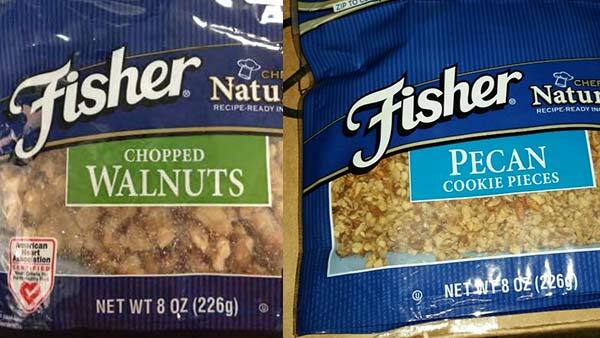 ELGIN, IL -- There is a warning about two Fisher nut products that may be contaminated with salmonella. Elgin based John B. Sanfilippo and Son, inc. is recalling Fisher 8oz Chopped Walnuts and Fisher 8oz Pecan Cookie Pieces. Consumers who have recently purchased the items with the BEST BY DATES listed below at stores located in AR, AZ, CO, KS, LA, MO, NM, OK, and TX or online should not consume this product and should return it to the store of purchase for a full refund or replacement. The BEST BY DATES can be found on the back of the bags. Both products are packaged in plastic bags. The recall includes items with "Best by Dates" of October 31, 2015; November 1, 2015; and November 3, 2015. Salmonella is an organism which can cause serious and sometimes fatal infections in young children, frail or elderly people and others with weakened immune systems. Healthy persons infected with Salmonella often experience fever, diarrhea (which may be bloody), nausea, vomiting and abdominal pain. In rare circumstances, infection with Salmonella can result in the organism getting into the bloodstream and producing more severe illnesses such as arterial infections (i.e., infected aneurysms), endocarditis and arthritis. Consumers or customers who have questions about the above recall may contact John B. Sanfilippo and Son, Inc. Customer Service toll-free at (800) 874-8734 Monday through Friday from 8:15 AM to 5:15 PM Central Time.